The Comprehensive Cancer Center at the Exempla Good Samaritan Medical Center opened its doors Tuesday September 3rd. The new four story, 87,600 square foot building, designed by Davis Partnership Architects, compliments the existing EGSMC campus and provides a state of the art healthcare facility where patients and families receive treatment in a caring environment. The Cancer Center’s first two floors are dedicated to comprehensive cancer care including radiation oncology, medical oncology and alternative therapies. Consolidating all cancer related services at the EGSMC Campus into one location for the comfort of patients and their families. The upper two floors will be leased physician office space. 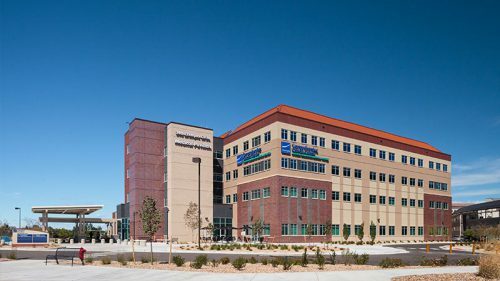 The Cancer Center was designed to accommodate future expansion for cancer related diagnostic and treatment modalities, additional infusion/medical oncology and more physician office space. The interior finishes were composed to link the external environment into the internal spaces. 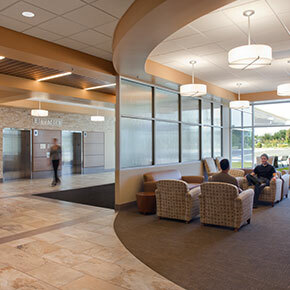 The colors of nature promote feelings of contemplation and serenity for each patient and visitor. Supple wood tones, greens mimicking grass, blues blending with the western sky and rusts simulating the red rocks of the area, mirror a natural environment for patients comfort. Soft lighting throughout grant guests an ambiance that reinforces the healing environment. The exterior spaces of the Cancer Center offer staff and visitors the ability to walk through landscaped plazas linked to open spaces around campus. The concept of this development advocates environmental sustainability through a wide variety of “green” practices and planting palette selection. Generous tree lawns and a series of passive open spaces provide areas of respite within the campus.